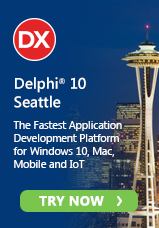 Delphi Starter and C++Builder Starter editions are now available. Embarcadero created the Starter editions of Delphi XE and C++Builder XE for developers who want to get started with Delphi and C++ development and even build a business with the apps that they create with Delphi and C++Builder but who may not yet be able to afford the Professional editions of those tools. Our goal is to make the tools accessible to millions of additional developers and give them a way to get started and generate up to $1,000 in revenue with the tools without a big up-front investment, and then the ability to move up to Professional or higher editions as their success and businesses grow. The Starter editions are also great for hobbyists who love programming and love using Delphi and C++Builder but don't make a lot of (or any) revenue from their applications. You can get the latest IDE and latest language features at a great price. If you go to the online purchase page for Canada, it is the C++ Started that is listed instead of Delphi Starter ... can you fix that?